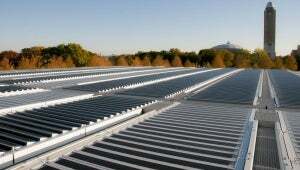 The glass roof of Kimbell Art Museum in Fort Worth, Texas, created by star architect Renzo Piano, has become the site of a spectacular installation of photovoltaic louvers. Since the end of October, a total of 2,403 moving layers, over a total area of 1,000m², have been in use, both for daylight regulation and the production of almost 1.4MWh of clean, green electricity: enough to meet the annual consumption needs of about 500 households a year. In his museum buildings, Renzo Piano experiments in particular with incidence of light, in order to be able to regulate daylight in the exhibition spaces. The challenge of this project for the two Austrian companies, GIG Facades and ertex solar, was the architect’s demands for a combination of sophisticated design, functionality and stable solar yields. The project, with its movable louvers, is the largest of its kind in the world. Image courtesy of ertex solar / Sprotofski.